At Bomba Tacos & Rum in Rocky River, Ohio, 17 varieties of tacos are spotlighted on the menu, including this vegetarian version. 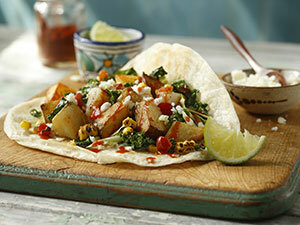 Charred corn kernels give these tacos a smoky profile while vegetables like vibrant green kale and sauteed golden potatoes pack a powerhouse of flavor as well as nutrition. 1. In large pot, bring salted water to boil. Add potatoes and cook 4 minutes or until just tender and drain. 2. In skillet, saute potatoes with 3 tablespoons oil until golden brown. Salt if desired. Remove potatoes from pan. In same skillet, saute garlic in 3 tablespoons oil for 30 seconds. Add kale, tomatoes and corn. Stir over medium-high heat just until kale is softened and vibrant green, about 3 minutes. 3. To serve, spread 1 tablespoon garlic mayonnaise down center of each tortilla. Top with 2 tablespoons shredded cabbage, about 1/3 cup each kale mixture and potatoes. Sprinkle with queso fresco and drizzle with hot sauce. Serve with lime wedges.